John Keats. Keats, John, photograph. The Library of Congress. John Keats is recognized as a key figure in the English Romantic movement, a period in which writers placed the individual at the core of all experience, valued imagination and beauty, and looked to nature for revelation of truth. Although his literary career spanned only four years and consisted of a mere fifty-four poems, Keats demonstrated remarkable intellectual and artistic development. Childhood and Family Tragedies. Scholars often note that Keats’s childhood provides no hint of the genius to emerge. Born October 31, 1795, the oldest of four children of a stable-keeper, Keats was raised in Moor-fields, London. His father died from injuries sustained in a fall from a horse when Keats was seven. This accident proved to be the first in a series of losses and dislocations that would pursue Keats throughout his brief life and convince him of art’s power to bring solace and meaning to human suffering. In 1803, Keats enrolled at the Clarke School in nearby Enfield, where he was distinguished only by his small stature (he was barely over five feet tall as an adult) and somewhat confrontational disposition. At the Clarke school, Keats first encountered the works that influenced his early poetry, including Edmund Spenser’s The Faerie Queene and John Lempriere’s Classical Dictionary, on which he based his knowledge of Greek mythology. Keats’s mother died of tuberculosis in 1810, and the Keats children were placed in the care of a guardian, Richard Abbey. At the time, tuberculosis was a pandemic in Europe. About 25 percent of all deaths in the early nineteenth century in Europe were attributable to tuberculosis. Doctors did not yet understand how the disease was spread, and accepted treatment for the disease often made the condition worse. Writing in Secret While Pursuing a Medical Career. At fifteen, Keats was apprenticed to an apothecary. Four years later, he entered Guy’s and St. Thomas’s Hospitals in London, where he completed medical courses and in 1816 passed the examinations to become an apothecary. Keats had begun to compose poetry as early as 1812, however, and secretly decided to support himself on his small inheritance after graduation and devote himself to writing. To avoid a confrontation with his guardian, Keats continued his studies to become a surgeon, carefully concealing his decision from Abbey until he had reached the age of majority and was free of his guardian’s jurisdiction. An Influential Circle of Friends. Keats’s meeting in 1816 with Leigh Hunt influenced his decision to pursue a career as a poet, and Hunt published Keats’s early poems in his liberal journal, the Examiner. Keats was drawn readily into Hunt’s circle, which included the poet John Hamilton Reynolds, the critic William Hazlitt, and the painter Benjamin Robert Haydon. Poems, an early collection, was published in 1817 but received little attention. His next work, Endymion: A Poetic Romance, a full-length allegory based on Greek mythology, was published the following year to mixed reviews. Soon after the appearance of Endymion, Keats began to experience the first symptoms of tuberculosis, the disease that had killed his mother and in 1818 his brother, Tom. Following Tom’s death, Keats lived with his close friend Charles Armitage Brown in Hampstead. ‘‘Half in love with easeful Death...”. It was around this time that he composed his famous ‘‘Ode to a Nightingale,’’ a moody, sumptuous poem in which the speaker lauds the beautiful sound of the nightingale and fantasizes about dying—‘‘to cease upon the midnight with no pain’’—and forgetting all ‘‘the weariness, the fever, and the fret.’’ The poem seems to be a clear reaction to Tom’s death and his own infirmity, as Keats laments that he lives in a world where ‘‘youth grows pale, and spectre-thin, and dies.’’ At the same time, the poem calls the bird ‘‘immortal’’ and timeless. The bird represents Keats the poet, capable of producing a beautiful ‘‘song’’ that will live after he is gone. Keats continued writing and spent a considerable amount of time reading the works of William Wordsworth, John Milton, and Shakespeare. Here Keats also fell in love with Fanny Brawne, a neighbor’s daughter. The rigors of work, poor health, and constant financial difficulties prevented the two from fulfilling their desire to be married. Napoleon Bonaparte (1769-1821): General of the French Revolution and, later, emperor of France. William Wordsworth (1770-1850): Wordsworth was the most influential of the Romantic poets and the one who most emphasized the importance of nature. Simon Bolivar (1783-1830): This South American liberator eventually died of tuberculosis. George Gordon, Lord Byron (1788-1824): This notorious and melancholy Romantic poet was known for his dark moods and stormy lines. Walt Whitman (1819-1892): Although American, Whitman wrote poems on some of the same themes as his fellow Romantics across the ocean; namely, a celebration of nature and an appreciation of artistic passion. Matthew Arnold (1822-1888): A great poet of the late Victorian era, Arnold cited Keats as a major influence. 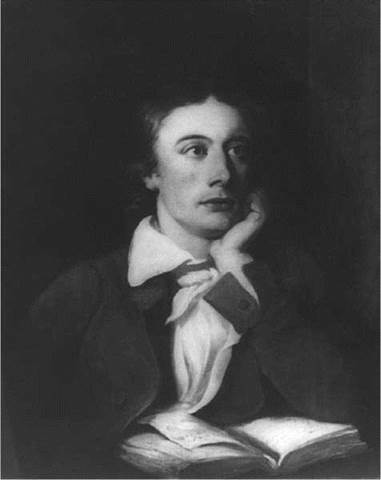 Keats’s poems, especially the later works published in Lamia, Isabella, The Eve of St. Agnes, and Other Poems (1820), are praised not only for their sensuous imagery and passionate tone but also for the insight they provide into aesthetic and human concerns, particularly the transience of beauty and happiness. The artistic philosophy described in the famous quote from Keats’s ‘‘Ode on a Grecian Urn’’—‘‘beauty is truth, truth beauty’’—is clarified in his correspondence with his family and friends. In these letters, which some readers value as much as his poems, it is possible to trace the evolution of Keats’s poetic thought and technique as he matured. Romantic Movement. Keats was a quintessential Romantic poet. The Romantic Movement in literature, which began in the late eighteenth century, was a reaction against what was seen as the cold rationality of the Enlightenment period. During the Enlightenment, developments in science and technology ushered in the massive social changes in western society. The Industrial Revolution brought about population explosions in European cities while the works of political scientists and philosophers laid the groundwork for the American and French Revolutions. The Romantics viewed science and technology skeptically, and stressed the beauty of nature and individual emotion in their work. Transience of Life. Perhaps because of the widespread presence of tuberculosis among those he loved and in Europe in general, Keats seemed to recognize that time moved swiftly and that life was fleeting. ‘‘I have lov’d the principle of beauty in all things, and if I had had time I would have made myself remembered,’’ Keats wrote to Fanny Brawne in February 1820, just after he became ill. In Keats’s work, the struggle with aesthetic form becomes an image of a struggle for meaning against the limits of experience. The very form of his art seems to embody and interpret the conflicts of mortality and desire. The urgency of this poetry has always appeared greater to his readers for his intense love of beauty and his tragically short life. Keats approached the relations among experience, imagination, art, and illusion with penetrating thoughtfulness, with neither sentimentality nor cynicism but with a delight in the ways in which beauty, in its own subtle and often surprising ways, reveals the truth. The Iliad (7th-8th century B.C.E. ), by Homer. The famous hero of this epic, Achilles, chooses death in battle over a long, peaceful life because attaining glory in battle means his name will be immortalized. The Stranger (1942), by Albert Camus. This novel's protagonist is convinced that the universe is indifferent to the desires and actions of humans. ''Annabel Lee'' (1849), by Edgar Allan Poe. This long poem commemorates, rather morbidly, the death of a young girl and her influence on the speaker. The Diary of a Young Girl (1942), by Anne Frank. Written while hiding from the Nazis in Amsterdam, this diary details the trials Frank's family went through before they were sent to a concentration camp. The Unbearable Lightness of Being (1982), by Milan Kundera. Set in springtime in a politically unbalanced Prague, the characters, most of them artists, feel that their lives are fleeting; thus, although they create with purpose, they also hesitate and often choose badly when it comes to their personal lives. 1. If you are interested in the impact of tuberculosis on nineteenth-century European culture, The White Plague: Tuberculosis, Man, and Society (1952), by Rene DuBos, provides an excellent introduction. In this landmark study of the social meaning of tuberculosis, DuBos prominently features Keats and the myths surrounding his illness. 2. Research the myth of Endymion, and then read Keats’s poem. What do you think attracted Keats to the myth? What changes did he make to it? 3. Do you also see Keats as a tragic and sympathetic personality? What advice would you give him if you could? 4. Keats and many other Romantics were preoccupied with perception and how an individual’s view of the world alters what is seen and experienced. Look up the definition of solipsism and argue whether Keats is a solipsist at heart. Bush, Douglas. John Keats: His Life and Writings. New York: Macmillan, 1966. Colvin, Sidney. John Keats: His Life and Poetry. London: Macmillan / New York: Scribners, 1917. Evert, Walter. Aesthetic and Myth in the Poetry of Keats. Princeton, U.K.: Princeton University Press, 1965. Levinson, Marjorie. Keats’s Life of Allegory. Oxford: Blackwell, 1988. Matthews, G. M., ed. Keats: The Critical Heritage. New York: Barnes and Noble, 1971. Ryan, Robert M. Keats: The Religious Sense. Princeton: Princeton University Press, 1976. Sharp, Ronald A. Keats, Skepticism, and the Religion of Beauty. Athens: University of Georgia Press, 1979. Sperry, Stuart. Keats the Poet. Princeton: Princeton University Press, 1973. Thorpe, Clarence De Witt. The Mind of John Keats. New York: Oxford University Press, 1962.